Whether you have a business, a blog, or both, your goal is to attract consumers and readers. These days, people have an almost endless array of options when seeking information. In order to stay on top of competitors, and keep gathering consumers, you must make their online experience as user-friendly as possible. Part of this is making sure your website design works well on all devices. Mobile responsiveness is a necessity for several reasons. People use the internet for everything from reading the news to shopping. More and more, they’re doing that from their smart phones and tablets. While waiting in line at the DMV, grabbing lunch with a friend, or taking a coffee break at work, people are consuming information and shopping from their phones. The Consumer Technology Association reported that Black Friday and Cyber Monday shoppers are increasingly reaching for their phones instead of their laptops. This year was a record year, with the percentage of people shopping via smart phones rising seven percent. Because of this, no website can afford to ignore mobile responsiveness. You can’t wait for consumers to sit down at a computer; you have to be where they are at all times. Websites have mere seconds to grab users’ attention and hold it. If your site is too slow for a reader’s or consumer’s liking, or is too difficult to navigate, users will leave in a hurry. It’s a rarity for someone to stick around and wait for slow loading times or fumble around a website seeking information. If you don’t have a mobile responsive site, you’re handing your consumers over to your competitors. There’s no better place than the top. And if you’re trying to climb the Google ranks, you’ll want to pay attention to mobile searches as well as desktop and laptop searches. In an effort to provide fast, quality experiences to their users, Google is cracking down on websites that aren’t mobile-friendly. Their ever-changing algorithms are hard at work, checking every website’s mobile performance. When someone uses their mobile device for a web search, your website has a greater chance at being seen if it has a responsive web design. It also doesn’t begin and end with Google. Other major search engines, such as Bing and Yahoo, are constantly vying for users’ attention. This means they’re also looking at your site’s mobile-responsiveness. 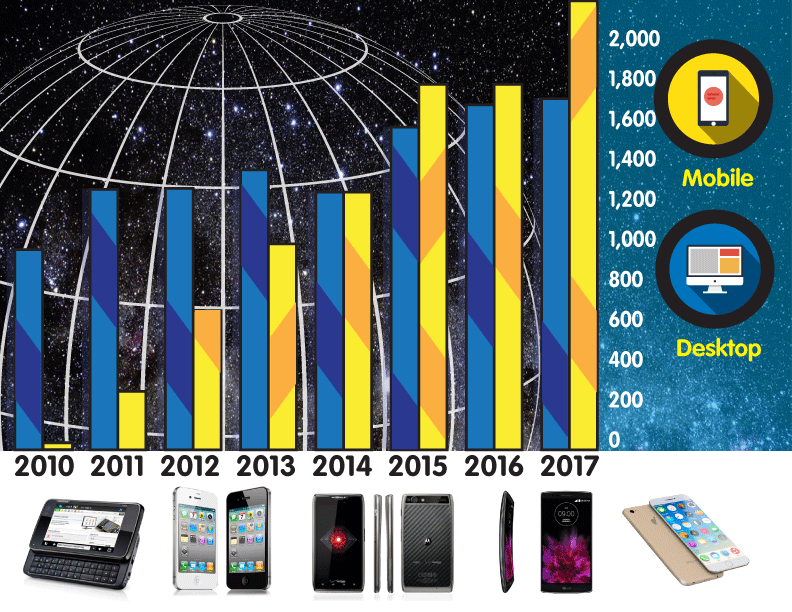 Mobile internet access eclipsed desktop in 2014. If you want to be seen as a professional, an influencer, and a trusted expert in your field, you’ll need to use all the tricks in your bag. That includes keeping up with the times. Technology may be advancing at light speed, but your readers and consumers expect you to adapt quickly. By keeping pace with these advances, you not only show your online prowess, you also show your commitment to meeting your consumers’ needs. When a reader or potential customer questions the look and feel of a website, they may question the competency of the company or person behind it. Even if unfounded, this is not an impression you can afford to have on someone. You work hard to make sure you provide people with quality goods, services, and information. However, in order to get to those people in the first place, and then hang on to them, you must be accessible. Your website should be easy to find, easy to use, and pleasing to the eye. A mobile responsive design does all of this, as well as touts your professionalism and ability to adapt to changing times. This site is hosted by Hosting2020. Great article! Can’t really tell who wrote it, but whoever it was did a great job. Mobile is huge nowadays and only geting huger!